Gold futures closed lower on Friday, taking back enough of the prior day’s winnings to settle slightly lower on the week. Gold for April delivery on Friday declined $10.70, or 0.9%, to settle at $1,254.30 an ounce on the Comex division of the New York Mercantile Exchange. On Thursday, prices rallied $35.20 or 2.9%. "Equities are firmer on the day [Friday], and that’s driving safe haven demand away from precious metals," Bloomberg News quoted David Meger, the director of metals trading at High Ridge Futures in Chicago, said in a telephone interview. "We saw a very extended move on gold, so consider this profit-taking or a retracement after the aggressive move to the upside." 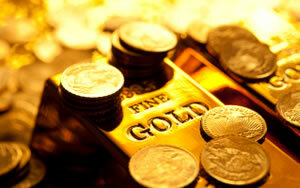 Gold futures logged a weekly decline of 0.4%. They slipped 0.9% last week but surged 4.1% in the week before then. The yellow metal is 18.3% higher so far this year. Out of 34 market experts contacted, 15 responded, of which seven, or 47%, said they expect to see higher prices next week. Five professionals, or 33%, said they expect see lower prices, and three participants or 20% were neutral." Elsewhere on Friday, silver for May delivery fell 22.2 cents, or 1.4%, to settle at $15.811 an ounce. One day earlier, the precious metal soared 81.4 cents to close at its highest price since Oct. 28. "We saw the added interest moving into silver and that could be due to the fact that gold is up 18 percent this year and although investors are still looking for upside potential, they are also starting to look for relative value," Reuters quoted Saxo Bank senior manager Ole Hansen. "You can argue the fundamentals in silver potentially improving over the year, with supply being reduced from the mining of other metals." As for the week, silver prices advanced 1.3%. They dipped 0.6% last week and rallied 6.7% in the week before then. They are $2.01, or 14.6%, higher than their final 2015 settlement of $13.80 an ounce. April platinum declined $18.60, or 1.9%, to $970.50 an ounce, but edged up 80 cents from a week earlier. Palladium for June delivery fell $7.75, or 1.3%, to $590.05 an ounce, yet jumped 1.7% on the week. For the year to date, platinum and palladium are higher by 8.7% and 5%. Gold fell $14.40, or 1.1%, to $1,252.10 an ounce. Silver added 21 cents, or 1.3%, to $15.94 an ounce. Platinum declined $16, or 1.6%, to $972 an ounce. Palladium added $4, or 0.7%, to $593 an ounce. For the week, gainers included silver by 2.8% and palladium by 3% while gold fell 1% and platinum dipped 0.2%. U.S. Mint weekly bullion sales were mixed as compared to a week ago with silver sales steady and gold sales lower. Gold coin sales rose 9,000 ounces this week compared to 16,000 ounces last week. Sales splits include 7,000 ounces in American Gold Eagles versus 14,000 ounces previously and 2,000 ounces in American Gold Buffalo coins to match last week. Like last week, silver coin sales moved up by 1 million ounces and American Silver Eagles accounted for the entire total. The U.S. Mint is rationing weekly sales of the bullion coins because of silver planchet shortages. The final batch of this week’s supply was ordered on Wednesday. Their cumulative 2016 sales of 13 million coins is 22.8% higher than through the same time in record year 2015.